We know you smile is important to you. And with the use of a clear orthodontic aligner, also known as Essix Aligners, you can make sure your smile is in peak condition. The process for creating your custom fitted aligner starts by making a 3D digital model of your mouth using a unique system which combines intra-oral photos taken in our clinic to render a complete replica of your dental profile. This digital replica will be used by Dr. Peterson to precisely design and construct your aligner. The best part, no need for a messy, cold, and unpleasant impression using a molding compound. The process is also more accurate than the traditional impression method. After the initial design is completed, Dr. Peterson will do an in-depth consultation with you to discuss the treatment plan. Once the consultation is completed you will have the opportunity to ask any questions you may have about the treatment and decide whether or not to continue. Once you are comfortable with the treatment plan, Dr. Peterson will start the full design and construction process for your aligner. Unlike the standard fabrication method which requires the Dentist to send out an impression to a central orthodontic lab to have your aligner made, River Crossing constructs all aligners inhouse. By keeping the fabrication close by, Dr. Peterson can oversee the entire process and make sure your aligner is molded to your mouth, for a perfect fit. The fabrication process includes making the ridged structure which will fit over your teeth. This will be the part of the aligner that helps to readjust and straighten your dental profile. A 3D printer is used to make a positive mold from the digital 3D model. Once the mold is completed a clear polypropylene sheet is heated and vacuum formed over the mold, creative a negative impression which will clip (fit) onto the teeth. After the aligner has been formed Dr. Peterson will examine it and trim any part that needs adjusting. Once everything is checked and fitted properly you’ll be all set. Your new orthodontic aligner is ready. 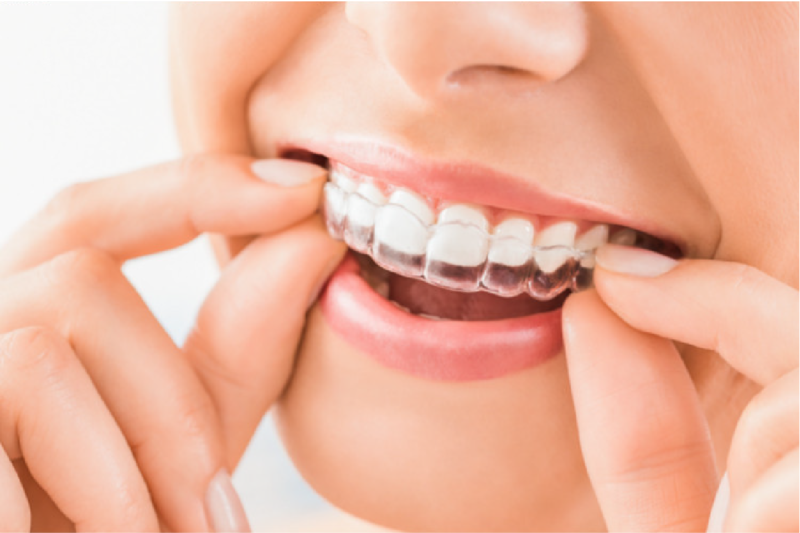 Clear Orthodontic aligners are almost invisible have minimal effect on your speech and are inexpensive. Put your best smile forward.